Deontay Wilder was always going to have a tough job. Holding the WBC belt versus the WBO, IBF, WBA, of Matchroom’s Anthony Joshua must be a bit like winning the egg and spoon race at school sports day while, across the field, Jimi Hendrix is playing at Woodstock. You’re still a winner, but who cares. I watched the Wilder v Ortiz fight again today. I felt it was the right thing to do since Matchroom had finally officially announced the contract extension – 3 years – for Joshua. It’s a success story for AJ, Matchroom and, ultimately, British Boxing but I felt cheated. It was as if I was sensing another lock-out of the division, where money talks louder than belts and fights are made on spreadsheets. Yes, that fight with Ortiz was decent from round five. I imagine fighting Ortiz must be like watching a rumbling boulder moving gently down a canvas covered slope. And you know it’s heading your way. There’s no finesse with Ortiz but he will keep on, head bobbing slowly, left hand primed, right paw lobbing out from time to time just to remind you he’s still alive. Before the fight started I was banking on Ortiz finally finding the sweet spot on Wilder and proving to me that I knew everything anyone ever needed to know about heavyweight boxing. As usual I was wrong. All the years of the constant pseudo-critics saying Wilder was untested, his jaw was probably suspect, vanished that night against Ortiz. In a lot of ways, the Ortiz fight was to Wilder what the Klitschko bout was to Joshua. Two KO artists, suspect jaws, rapid rise, chiselled torsos gleaming under the Super Troupers, both finally showing us all that they were the real thing; that we knew absolutely nothing about boxing. 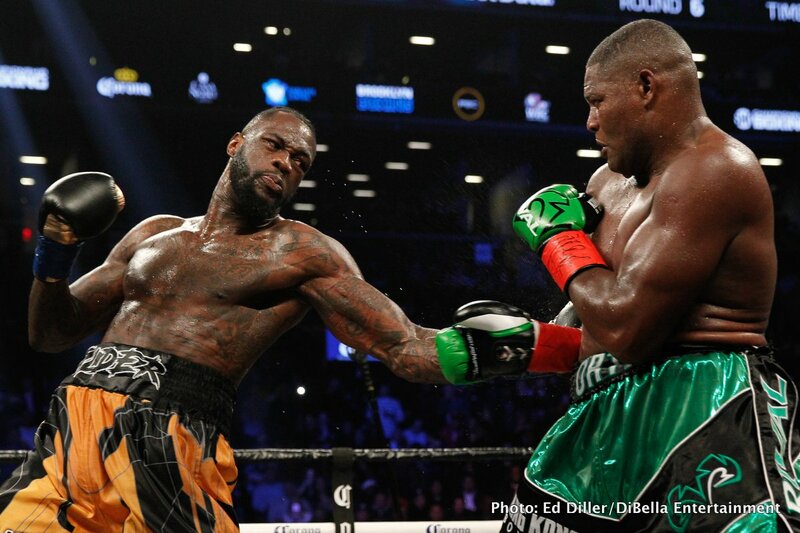 Wilder was punched ferociously by Ortiz in round five. Any of around five or six of those punches would have felled most heavyweights. The bell saved Wilder from a long spell of unconsciousness. But he beat off the hail in the sixth, gathered his wits, slowly came back to earth, and fought back into a bout he was losing. When the right hand finally came home in the tenth, Wilder looked as ecstatic as any hard-nosed bookie in the crowd. I was happy for him too. I thought we’d see Joshua v Wilder within eight months. After I finished watching the fight again this morning I was even angrier than I’d been before I clicked on the play button. I was absolutely certain in those immediate minutes that Matchroom had hoodwinked Wilder just to avoid the toughest test Joshua could face right now. Since the Ortiz fight I don’t believe Eddie Hearn wanted AJ anywhere near the Bronze Bomber until gazillions had been banked. It is good business sense, but it isn’t sport. The fight could have been made. Even Carl Froch said yesterday that the problem had not been Wilder, it was Eddie Hearn. Hearn appeared on camera during that interview, stage left, and harangued Froch for his comments, but Froch stuck to his guns. Think what you like about Carl Froch, but he’s good friends with Eddie Hearn and hasn’t ever been noted as a man who thinks about consequences before he talks. Was Hearn’s plan all along to put off Wilder, pray Dillian Whyte gets past Joseph Parker this Saturday, and then wait for Wilder to be forced into fighting Whyte as a mandatory challenger for his WBC belt? Meanwhile, Joshua makes hay in the boxing sunshine and waits, building hype and steam and PPV numbers for an eventual fight against Wilder or Whyte next summer? The winners here are clear: Matchroom/SKY. They get a large piece of each pie along the way. Everyone else just has to wait for the cold slice at the bottom of the fridge. Let’s hope it’s humble.